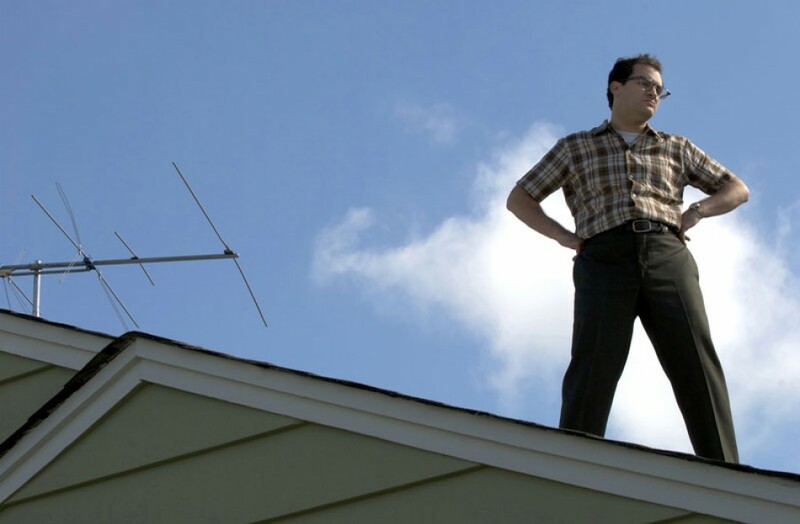 When I wrote about A Serious Man for Roger Ebert’s Far-Flung Correspondents, I got some flak for misrepresenting the Christian god, even though I was specifically writing about the Jewish god. Because I also cited a Gnostic myth, another commenter told me I didn’t understand Gnosticism. So here they are, one blaspheme at a time. Perhaps because he’s science fiction’s most self-aware robot, Bender’s had two run-ins with godhood. The first occurs in A Pharaoh to Remember, where Bender contrives events to become the next pharaoh, forcing the Egyptian slaves to build his mile-high effigy. Like the Tower of Babylon, Bender’s shrine breaks records before completely breaking down. Only 3 episodes later in Godfellas, when Bender is sent hurtling into space, his godly ideals are challenged when he becomes a god to the tiny organisms that have formed on his body. They worship him unflinchingly, even if his demands ultimately harm them. Eventually, a war breaks out between the organisms and everyone is destroyed. 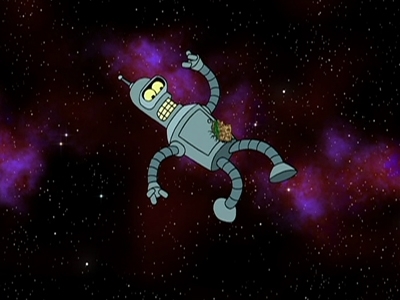 Mournful, Bender continues to hover aimlessly through space where he encounters a galaxy that reveals itself to be the one that hears all of the Earthlings’ prayers. This makes for one of the most interesting conversations on godhood that I’ve heard. Galaxy: Yes, I saw. You were doing well until everyone died. Bender: It was awful. I tried helping them. I tried not helping them. But in the end, I couldn’t do them any good. Do you think what I did was wrong? Galaxy: Right and wrong are just words. What matters is what you do. Bender: Yeah, I know. That’s why I asked if what I did was…oh, forget it. Galaxy: Bender, being God isn’t easy. If you do too much, people get dependent on you. If you do nothing, they lose hope. You have to use a light touch, like a safecracker or a pickpocket. Galaxy: Yes, if you make it look like an electrical thing. When you do things right, people won’t be sure you’ve done anything at all. Though God’s appearance is short and sweet, it’s still impactful. A lot of time is spent building up God, especially through two fallen angels played by Ben Affleck and Matt Damon. They question God’s authority and intentions, while wreaking havoc like little children to get her attention. Yep, turns out God’s a “she.” Which wasn’t as much of a twist as Kevin Smith’s playful treatment of her. In one minute, she’s blowing up an angel’s head with the sound of her voice; in another, she’s doing handstands against a tree. Her expression is solemn for a moment, then her head tilts and she flashes a quick smile. Still, she manages to answer the question, “what’s God playing at” by cleaning up a large mess that was left in her name (an all-too-common scenario). Light-hearted and funny? A trifle. Irresponsible and thoughtless? Never. What I love about this movie isn’t the way its deities are portrayed; it’s the multi-layered storytelling, which so aptly echoes the nature of such myths and sacred stories. There are four narrative levels in all. The first tells the story of Sita and Rama in the form of the Rajput paintings we often associate with Indian art. When narrators interject to debate certain story details, they appear as shadow puppets. At various points in the movie, different Annette Henshaw songs are used to illustrate events in Sita’s life, and these are choreographed in distinctive flash animation. Finally, as the story itself is a parallel between Sita and lead animator Nina Paley, the “real life” bits are animated in a less ornate, more primitive “squiggly” style. There are many ways of telling a story, and even more ways of looking at it. That’s Sita in a nutshell. Though it was a short-lived series, what I liked about this show was its ambiguous portrayal of God. The writers seemed aware that so much was riding on this interpretation, and that it had to be fair and modern while also reflecting well known theological notions. There were even a set of commandments that writers had to follow when creating God. In one of the more powerful episodes, Joan deals with the sudden and cruel death of a friend. Her boyfriend Adam offers the first bit of wisdom when he tells Joan that her friend indirectly killed herself by constantly chasing dangerous situations. Just then, Joan spots God walking three dogs (allusion alert! ), and she does what most people do when they have the opportunity to speak to God directly: she asks why. God doesn’t have an answer, perhaps because Adam already gave it. All he can do is show her how to cope: put your feelings in a box and juggle them so you only ever carry as much as you can. In the only veritable on-screen existential crisis I’ve seen, a brother and sister figure their bad luck is down to them being characters in a novel. So they start spreading mayhem to get the author’s attention. They commit just about every crime: they rob a pharmacy; they shoot people; they kidnap a policewoman, who becomes their willing accessory (not to mention the brother’s lover). 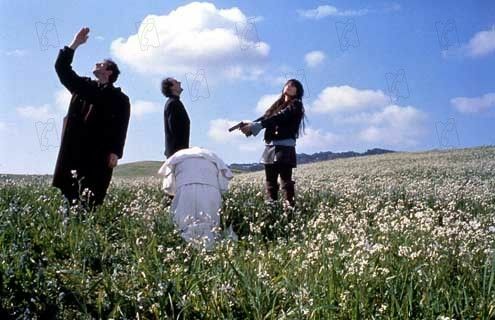 On the journey, they recruit a number of accomplices, including a priest and a suicidal woman, believing that each might bring them closer to God. Finally, they meet the big G, who’s busy throwing novels into the air and shooting them with a rifle. Is each novel a life that’s come to its merciless end? Perhaps, but that’s different: God has a plan. “You guys can’t just go around exacting chaos because you’re pissed at me,” he warns the brother and sister. But they don’t listen, and shortly after, the whole horde dies in a violent car crash. Maybe we’re all writers and God is the editor, who decides when it’s a good time to finish the story. You don’t have to know the story of the Demiurge to appreciate this episode. I like to focus on the main conflict. Aeon, who represents anarchy, wants to send the god-like Demiurge into space and rid the world of its presence. Trevor, who represents autocracy, wants to use it to enlighten the masses. The two argue back and forth about knowledge. Aeon wants the opportunity to acquire it for herself, to extract significance from her existence through her own means. Trevor sees the Demiurge as a chance to live in collective peace under the influence of one governing truth. Several characters are resurrected in this episode, each more powerful and virtuous than in their previous form. Trevor tells Aeon she wants to get rid of the Demiurge to avoid facing her sins. Conversely, Aeon calls Trevor on desiring the Demiurge’s salvation for the same reasons. This isn’t on TV, but it should be. Until it finds a suitable, gutsy network, it’ll reside on its Youtube channel, where it gets the accolades (and occasional trolls) it deserves. Creator Brian Keith Dalton came from a Mormon family and eventually decided not to follow along. This guy knows his theology, which is what makes the satire so tight. The premise is that God plans to create a world and needs the help of his staff to make sure the whole thing works out. He isn’t particularly smart, he’s rather vain and parts of his plan don’t really hold together well (“We can fix it in post,” his staffer tells him when someone points out that you can’t create flowers without first creating the light they need to grow). The Larry David comparisons are understandable, but Mr. Deity is slightly more likable. Slightly. As an agnostic, I don’t accept that Jesus is God. I do, however, accept that to many people, Jesus and God are the same person. So it’s worth noting this construct, which takes the Good Book at face value. Was Jesus a racist or wasn’t he? I suppose you’d have to ask a Samaritan. I’ve seen some of the vids you’ve posted, and I dunno. Futurama is always fun. Kevin Smith just bores me, but that may be because I don’t find him nearly as insightful as he finds himself. I had to watch the last one, just because. It’s clever, in an absurd sort of way, because it completely flips the underlying historical reality of that familiar narrative. First century Judeans hated Samaritans for a range of different reasons, mostly having to do with an centuries old argument over where you could site a temple. Really. To pitch a Samaritan out as emblematic of the highest level of moral virtue was radically subversive…a bit like telling a bunch of American conservatives that a Pakistani Muslim represented all that was true and good. So…was Jesus racist? Not even slightly. That’s what makes the video funny for me, sorta like watching a comedy sketch of a drunken Ghandi starting a bar fight. Livvy Jams: Heya! You know, Gandhi starting a bar brawl would be a totally funny skit. Glad Christianity likes me. Not all Christians do, but I can live with that. And at least you and I are buds. 😉 Thanks also for your insights on the Samaritan bit. I’m glad you found it funny. Livvy Jams: Ha! Love the skits. I’ll listen to the song this afternoon.